Details: It's time for Italian Wine to take a backseat. 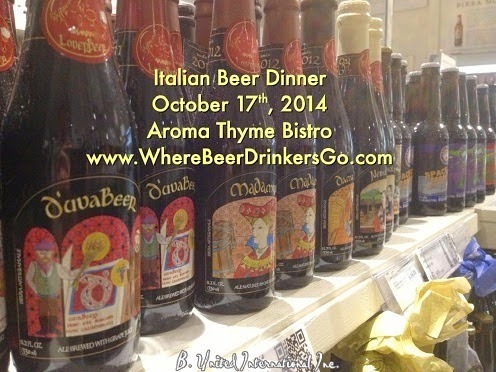 We are showing off Italian Craft Beer at our next beer dinner. Italian craft beer seems to get lost to all the famous wine that comes from Italy. Many people would never, and don't, know that Italy makes outrageous craft beer. Join Chef Marcus Guiliano as he pairs Italian beer with Aroma Thyme's Green Certified© cuisine. Many people think of Moretti (owned by Heineken) and Peroni (owned by Miller) for Italian beer. Those may be Italian indeed. But Italy offers so much more on the craft beer scene. The boutique craft beer movement has not excluded at all. In fact it's stronger than ever. In Mario Batali's Eatly Italian superstore, in NYC, there is row after row of Italian craft beer. This dinner is five beers and four courses for $65. RSVP to 845-647-3000.